Newbald has 2 defibrillators – one in North Newbald and one in South Newbald. Given how far Newbald is from the nearest ambulance station, it is reassuring to know that we have two pieces of vital life saving equipment in the village. 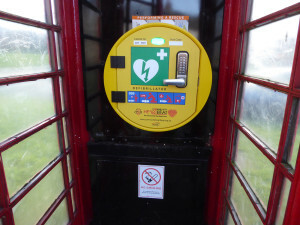 The first defibrillator was installed late 2015 in the phone box on the village green. Newbald Parish Council purchased the phone box for £1 from BT. The phone box was restored to its former glory in August 2017, thanks to the hard work of volunteer and resident, David Burton. Take a look at the pictures here. Newbald Parish Council would like to say thank you to East Riding of Yorkshire Council who provided us with a grant towards the cost of the defibrillator and to the Community Heartbeat Trust for its work in organising it. Also, many thanks to Knight Robie Ltd who generously installed the defibrillator for free and negotiated free supplies of the fittings and equipment they needed to carry out the work. 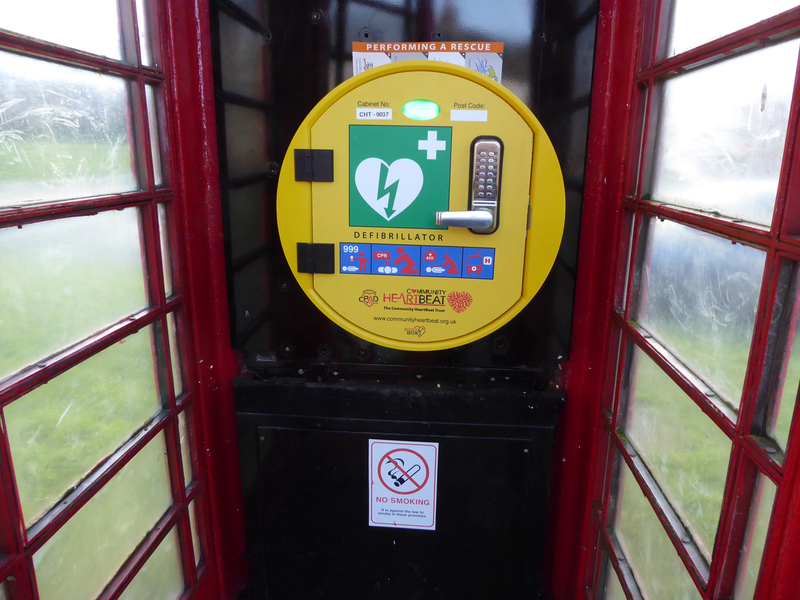 The second defibrillator was installed on 23 August 2018 in South Newbald. Newbald Parish Council would like to say thank you to Simon Dixon of Rockar Ltd for allowing the defibrillator to be mounted on the side of their office in Monckton Court and for donating a generous £500 towards the cost of it. A big thank you also goes to PJS Electrical & Alarm Services Ltd This company very kindly volunteered to install the defibrillator for free, including providing all the necessary fixtures and fittings. Both defibrillators are registered with the ambulance service, who will give you full instructions when you phone 999 in the event of an emergency. It is the ambulance service that will give you the access code to enable you to get the defibrillator out of its box. The defibrillators are designed to be very easy to use with full audio instructions provided to the user at the point of requiring it. Here are some instructions on how to use the defibrillator. The Parish Council has run two courses on how to use a defibrillator, both of which were free to attend. If there is sufficient interest expressed, we would look to organise another one. Please register your interest by emailing clerk@newbald.com.